In the legal glossary, you might have heard the terms deed and title, quite frequently. As the term, ‘deed’ represents a legal document duly signed by the and delivered, to transfer the ‘title’ or ownership/possession of propoerty or legal rights from one person to another. On the other hand, ‘title’ implies the combination of legal rights with respect to ownership, possession and charge of the property, that facilitates the holder to control or dispose off the property. These two terms are so closely intertwined that the line of demarcation between these two is subtle. However, they are not one and the same thing. 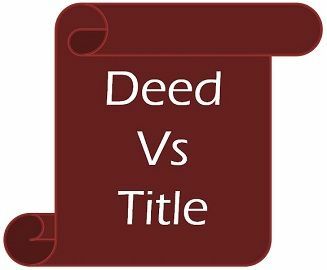 Check out this article, to know the basic points of difference between deed and title. Meaning A deed is a legal document used to confirm or convey the rights. The title is the name used to describe a person's legal position regarding something. What is it? A means of property interest transfer. A person's legal right to use the property. Represents The right to claim ownership of property. Ultimate holder of the property. By the term ‘deed’, we mean a legal and formal document in written form that is used to pass on or confirm an interest, asset or rights. To become enforceable, the document should be clearly specified as a deed on the face. The instrument is duly stamped, signed by the grantor, attested in the presence of witnesses and delivered to the grantee. It is executed on a stamp paper of some value. A copy of the deed must be sent to the appropriate authority along with the required form. In general, the deed is used for the transfer of property. Signature of parties and witnesses. The proof that the owner possesses a particular asset lawfully or the legal right to use it is known as the title. To put simply, the term title represents the collection of rights of a particular person (title holder) over an asset. The rights of the title holder may include the right to own, use, sell, control and dispose of the asset, in the manner he thinks fit. The title explains the legal relationship of the title holder with the subject matter (property). It answers the question – to whom the property ultimately belongs to? The title is evidenced by an appropriate document, in most cases deed. A legal document used by a person to transfer the property or rights to another person is known as a deed. A title is described as a name used to describe the legal position of a person regarding something. A deed is a nothing but a means to property interest transfer. On the other hand, a title is the legal right of a person to use the property. A deed is always in writing and duly signed by the parties involved, whereas the title is abstract. A deed represents the right of the owner to claim the property. As opposed to the title, that describes, who hold the property in the end. After reviewing the above points, it is quite clear that the two are deed and title are related to each other, but they are different. While title shows the ultimate ownership over a particular property, a deed is a formally executed written document that sets up complete rights to the property.